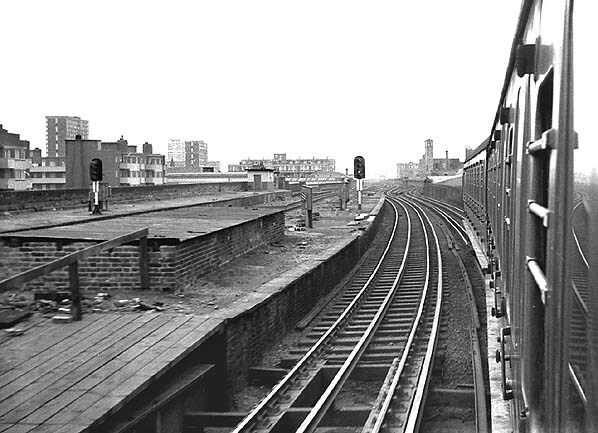 Notes: Haggerston Station was opened two years after the Broad Street line was completed. It was originally to be known as De-Beauvoir Town but this name was dropped before opening. It had three platform faces one of which was an island. Although the station only served the Poplar Line, up trains on the Willesden line could stop at the island platform if required. It was closed on 6.5.1940 and the roadside building on the east side of the viaduct was badly damaged in an air raid shortly afterwards. 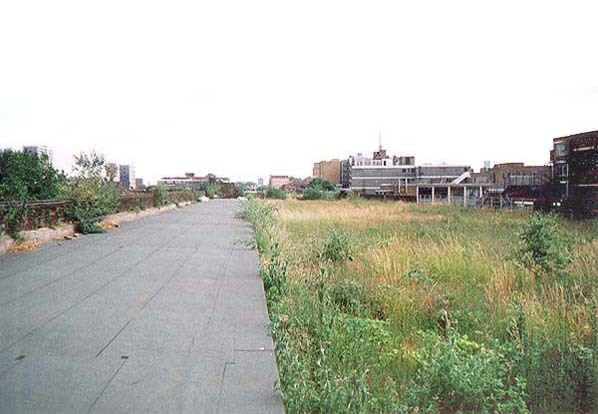 The island platform was demolished in the early 1970's but the side platform remaind until work started on the East London line extension in the mid 2000's. A new Haggerston Station will open on the same site in 2010 as part of the London Overground Network. The construction site was damaged by a fire in July 2008.
the West India Docks at Blackwall. 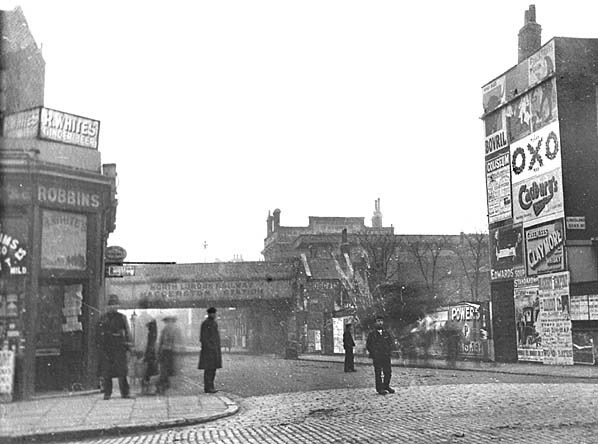 Initially planned as a freight only line, by the time the first five mile section of the East & West India Docks and Birmingham Junction Railway opened between Islington and Bow on 26th September 1850, it was also provided with a passenger service with an intermediate station at Hackney and another at Kingsland (Dalston) opening a month later. 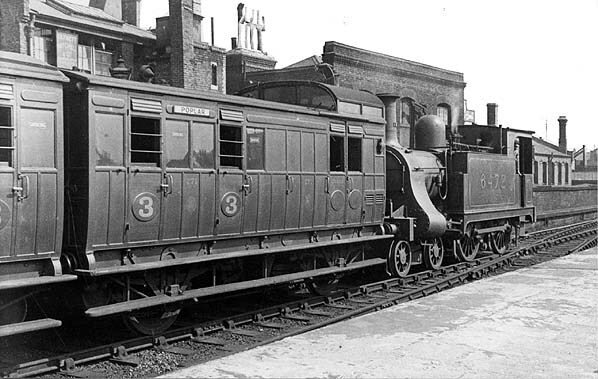 A six road locomotive shed opened at Bow in 1850. There was a connection at Bow with the London & Blackwall line allowing trains to run into their City terminus at Fenchurch Street. 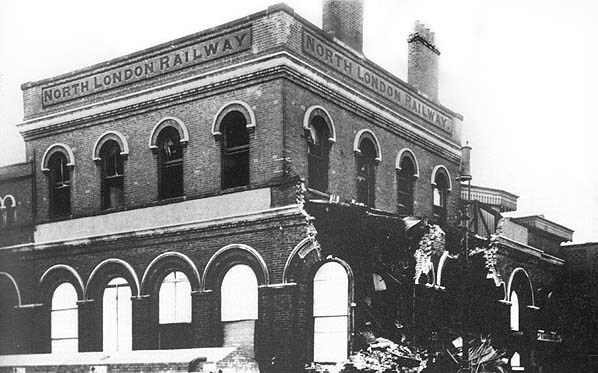 The company was nominally independent although the LNWR subscribed 67% of the capital. nearly 14 million in 1866;a fourth line was provided into Broad Street in 1874. On 18th January 1875 the Canonbury spur was opened giving access to the GNR network. The Richmond service was one of the few in London marked for the Beeching Axe in 1963. Strenuous opposition to closure by local authorities along the route brought a reprieve in 1965 and a modest modernisation scheme to cut costs was started in 1966, this involved singling the track out of Broad Street and removal of the junction to Poplar at Dalston. This ended any possibility of reopening the line to Poplar for which there had been much local support in the mid 1960's. end of the station. 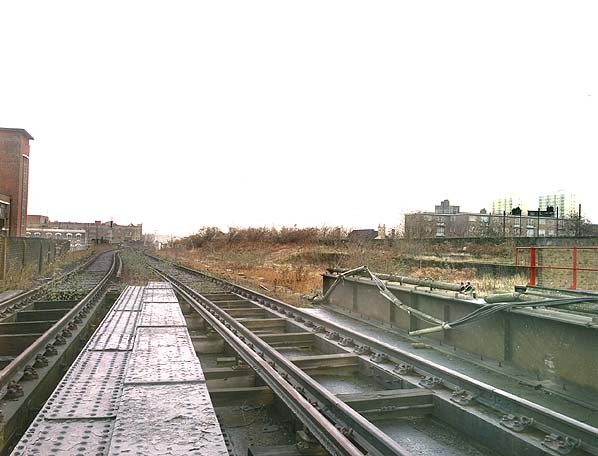 With the opening of a new connecting spur between the North London and the former Great Eastern line at Hackney the remaining. Broad Street trains were diverted into Liverpool Street bringing final closure to Broad Street and Dalston Junction on 30th June 1986. By the early 1990's the Watford Junction to Liverpool Street was reduced to just four trains Monday - Friday. This service was withdrawn in September 1992 with the closure of Primrose Hill station. AA12 (formerly 102M) can still be clearly seen by passing motorists. 1895 1:1.056 Town Plan shows the layout of Haggerston station with an island platform and a side platform which is devoid of any buildings on the up side. The main entrance is in Lee Street with a secondary entrance in Dunston Street, A signal box is seen at the north end of the island platform. Click here for a larger version.